One of the most bizarre episodes most recently carried on this blog was the news of the Mi-26 crash in Sangin last month, not only for the dubious history of the operator, but also for the fact that the MSM did not touch the story. 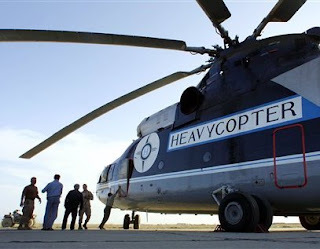 However, there was a brief flurry of interest when later that month an Mi-8 crashed at Kandahar airbase, killing 18, but there was absolutely nothing written about the operator, Vertikal-T, which also has a very dubious history. As to the British use of these helicopters, it is assumed, inter alia that these rather dubious operators were employed for their willingness to take risks and, especially, for their cheapness. However, it has also been admitted that the MoD does not deal directly with these operators but hires the helicopters through an intermediate company, Skylink, yet another operator with an extremely dubious history. But what now emerges from unlikely source is the actual cost of these helicopters. This comes from a private background briefing note being used by MoD press officers for when they talk to the media about helicopters, where it is revealed that the contract "provides 340 hrs at a cost of around £3.9M per month" (figures the defence secretary would never give to Parliament).